Take control over layout, colors and typography! 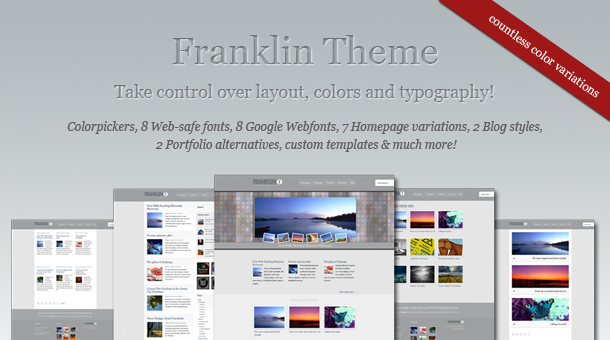 Franklin is an ultimate theme with tiny, dynamic and customizable design. Franklin is clean and elegant WordPress theme for your online portfolio, presentation or blog. Theme includes amazing functions and features such a colorpickers to setup your own color schemes, typography alternatives and layout variations. Three featured sliders, featured sections, two portfolio templates, four widget ready areas, more than 60 theme options and tons of amazing shortcodes! All powered byTheme Options Menu!